My office is located at 1133 Broadway, the St. James Building, designed by Bruce Price in 1896. The building has become an epicenter of design. There are currently 50 design firms in the building. I was recently interviewed for the Kew Management Company website. From his 1133 Broadway office, four floors up from the sidewalks of NoMad, Barry Goralnick has a bird’s eye view of the city he says inspires him. “Have you ever looked at the façade of this this building, and the surrounding buildings?” Barry said on a recent visit to his office, “they are absolutely beautiful.” He finds inspiration everywhere, because he looks at it with a broad humanistic eye. This eye has helped in all aspects of his work – from light fixtures inspired by stairway railings to interior designs based off of vintage store finds. The city in which he resides and the places he travels are the muse for his career. Goralnick is an architect, interior designer, product designer, and lecturer, and theater producer. His lengthy job description and unique ability to create timeless designs have brought him great success. He works alongside a small team to create beautiful interiors and homes, as well as products — ranging from lighting to furniture, carpet and fabrics (fabrics not official yet) — that are manufactured by some of the leading home furnishing companies in the country. For his product designs, he has won the “Best of Year Award” and has been nominated several years running for Innovation Awards. 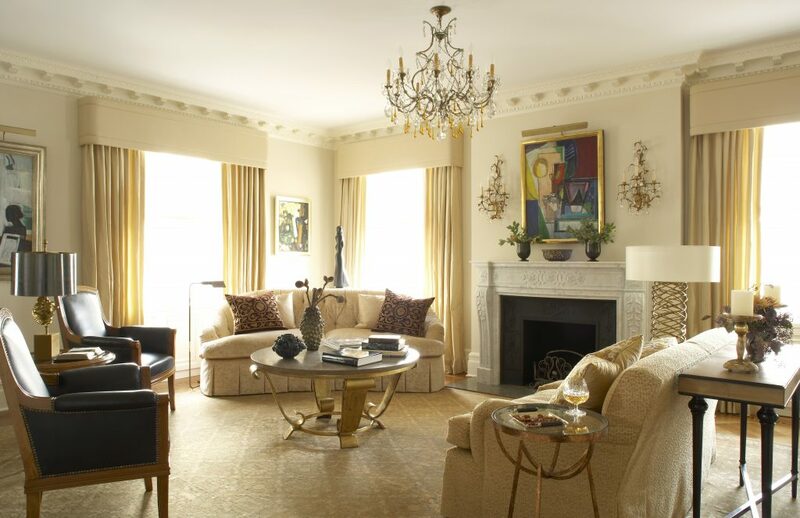 He also has a coveted spot in Rizzoli’s highly regarded Interior Design Master Class edited by Carl Dellatore. Perhaps most impressive beyond all this is Goralnick’s welcomed ability to describe complex design theories and numerous successes in a simple, humble way. He cites the instructors he had along the way as some of his biggest influences. “I had amazing teachers,” Barry said. “When I was an undergraduate, I was the only one in my class who went to architecture school; we weren’t geared towards that. But I had an architecture history teacher; he was just wonderful,. and he inspired me to choose my path” At Harvard I was lucky to study with Frank Gehry, Neil McKinnell, Fred Koetter and be critiqued by Philip Johnson, Charles Gwathmey, and Harry Cobb of I. M. Pei and Partners. Barry has not stopped learning. Today, he considers Jim Druckman, president and CEO of the New York Design Center at 200 Lexington Avenue, to be one of his greatest influences. “He has mentored many of New York’s top designers, Barry said. The two met when Druckman hosted a design competition requiring the creation of a new furniture or lighting piece. Barry entered a table and a light fixture and both were winning designs. He credits the beginning of his success in product design as a result of this competition twenty years ago. For this reason, Barry has taken it upon himself to help aspiring designers. “I try to give back by lecturing to students,” he said. He has spoken at high profile design schools such as Parsons School of Design, Pratt Institute, the New School, and New York University, as well as at NEOCON in Chicago. The Blended Modern concept becomes crystal clear to anyone stepping into Barry’s office. No clear theme can be assigned to the room, but it flows effortlessly. 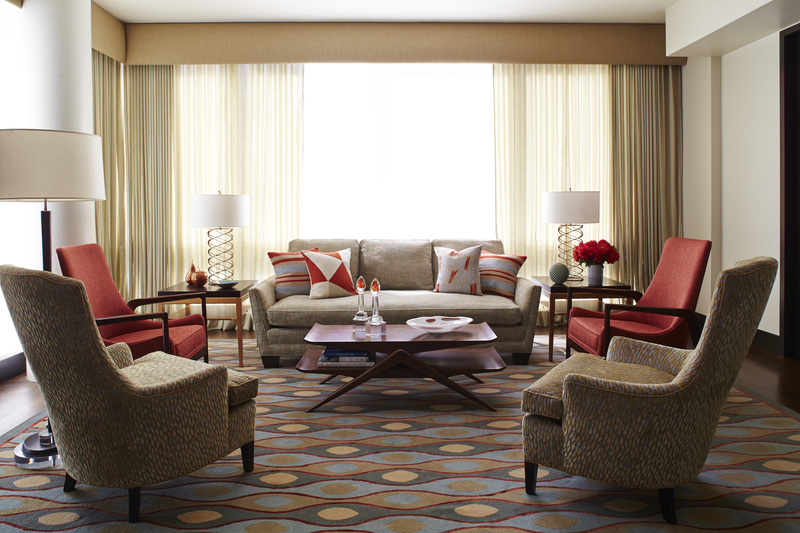 Vibrant colors pop throughout the room, from purple chairs sitting against dark wood floors to a bold orange lamp. Chandeliers from his own line hang from the ceiling, subtly drawing together the entire room. 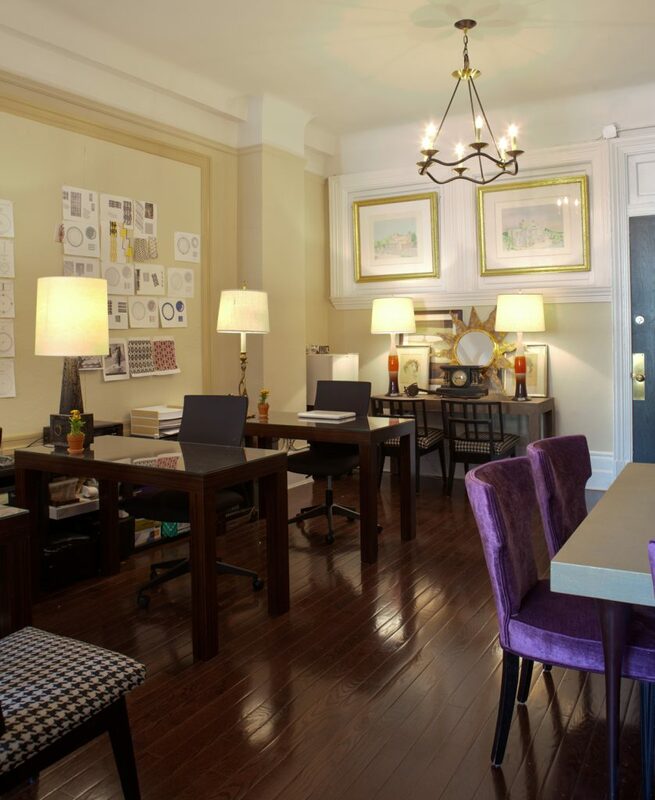 Past and future design projects are seen in sketches, mood boards and fabric swatches hanging from the walls. The beauty in the work is his ability to assemble these disparate pieces into a common theme, which might otherwise be invisible to others. He takes great joy in seeing others use the products he has designed. “The most exciting thing about doing this for me is seeing the way others incorporate my pieces,” he said. “I recently met this woman at a design conference who said ‘I just used your sofa in a living room’ and she sent me a picture. It was gorgeous. The importance Barry places on the relationship he shares with the companies that he designs for is similar to that of his own clients. 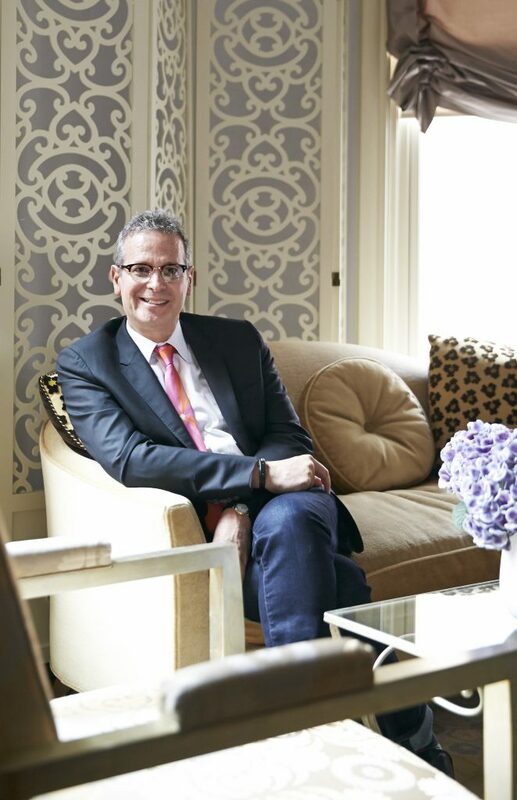 As seen in his article in Rizzoli’s Interior Design Master Class, he believes the relationship he has with is clients his more similar to that of psychiatrist to patient. “When we meet clients, it is almost like a session,” Barry said. “You are going to be spending a year or two talking all of the time.. You are designing their bedrooms and spaces they work in. You get to know people and their families intimately. Barry’s love for actors goes beyond his design business. He is an avid fan of the theatre and produces plays and musicals. He is capable of recommending and reciting a summary of virtually all past and present Broadway shows to date. Another way he fills his time outside of work is with the blog he writes for his website “at home, from six to nine o’clock in the morning.” He chronicles everything from hidden gems in the city to revolutions within the interior design industry, and occasionally, he even writes about his own upcoming work or the use of his products in other design styles. Between the “Blended Modern” style and his various product lines, Barry’s ideas are quickly spreading throughout the industry. His career is seemingly unstoppable and his work in molding the generations of designers to come is only furthering his influence. While the reach of his work has extended far beyond the island of Manhattan, luckily for us, the man himself can be found in his NoMad office – showing us the wonderful details of the city we might fail to see and be enriched by, through his window and his work. This entry was posted in Apartment Design, Architect, Art, Barry Goralnick, Bathroom, Carl J. Dellatore, Chair, Chandelier, Circa Lighting, Cocktail Tables, Furniture, Interior Design, Interior Design Master Class, Kichler, New York Design, Rizzoli Books, Uncategorized, Visual Comfort. Bookmark the permalink.